15 comments posted so far. Login to add a comment. lol nice!! but still uphill so its not so much power anyway! The third wheel is the trailers wheel #2. It's not attached to the truck. That looks like one serious design flaw. You would never want your front steering wheels to leave the ground. #6 .. but thats the nice thing about wheelies! lol just to mutch weight in rear.. so it wheelies..
A lot of heavy truck and trailer suspensions are like that, both rear axles are solidly mounted on each end of an arm that is attached to the frame at a single point in the middle, like a teeter-totter. That way, as an axle passes over a speed bump, for example, the frame only rises half as much as the wheel. #1 has NO IDEA what he is talking about! We call them B-Doubles in Australia. A prime mover with two trailers. If you drive up a grade and plant your foot you can lift the steer wheels off the ground, some times on level ground as well. Nothing special about it, my truck will do it with out much effort. But it is not advised. LET ME KNOW IF YOU FIND A TRUCK INCAPABLE OF THIS TRICK . I AM A TRUCK DRIVER. AND A MECH. 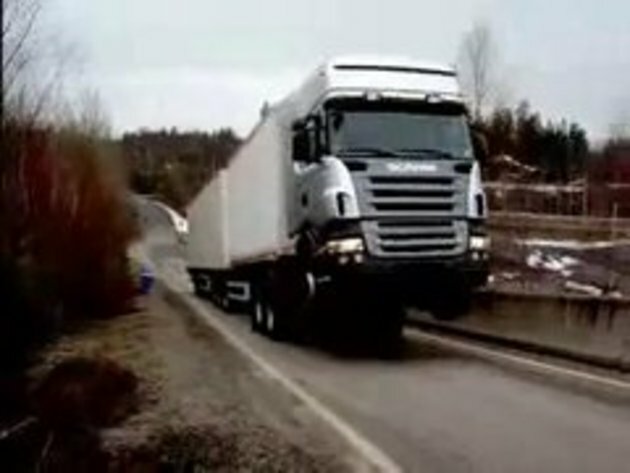 the truck is for real doing a wheelie! not fake and Wikipedia is wrong 75% of the time. It is written and edited by internet retards. not fake and good vid! Is it really that hard with a trailer attached to add weight? Without the trailer, this would really be a challenge!